The City should incorporate street trees and zebra crossings in its two-way conversion of MacNab Street. There are lots of good discussion and momentum happening right now around town, and I've been really keen on the Cannon ideas that are gaining steam. RTH published an article last Friday about the City taking more interest in crosswalks, and I got thinking about the upcoming two-way conversion on MacNab Street between Cannon and Burlington. I was at the market on the weekend and walked on MacNab and Vine up to Cannon. The pedestrian traffic coming to and from the other side of Cannon was remarkable: entire families and their kids on bikes, elderly folks, lots of walkers and so on. I observed the sidewalks and the crosswalks and noticed that it wouldn't take much to turn MacNab and Vine into really attractive streets to walk. Notice the regularly-spaced trees on the portion of sidewalk closest to the curb? This leaves pedestrian flow on the typically-wide sidewalk. MacNab could easily do this from York to Cannon. What a difference it would make to add a great tree canopy to that street! The other thing I noticed was the crosswalks. I'd like to see an all-way stop sign at Vine/Park and Vine/MacNab. We should also get public works to install the bold zebra crosswalks at both of these crosswalks, along with Cannon/MacNab and Cannon/James. The RTH piece I started with above shows the new zebra crossings in Westdale at Sterling and Forsyth, right by the entrance to McMaster. The pedestrian traffic definitely warrants it. Making the streets more accommodating will ony increase that traffic. 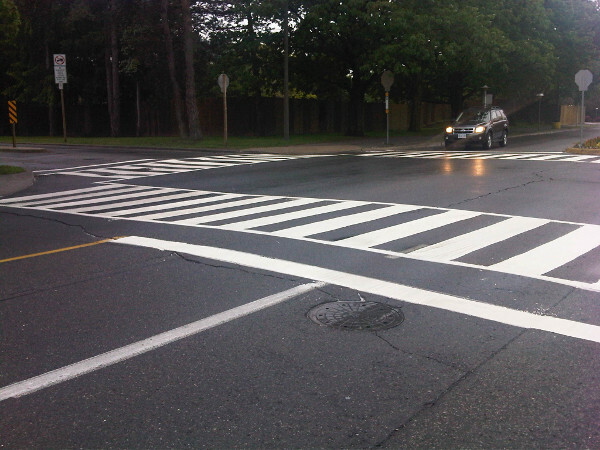 So far, the only new crosswalks painted have been in affluent west end neighbourhoods. The perception exists that the City is not giving equitable treatment to more vulnerable neighbourhoods. Of course, the intersection of James and Cannon is a no-brainer for zebra crossings. There are huge pedestrian volumes there, where walkable James Street North interacts with a dangerous freeway. A stable, vibrant residential neighbourhood north of Cannon uses Park and MacNab to come downtown everyday. Adding in zebra crosswalks and planting trees on these few blocks just north of the market would show a lot to folks who are passionate about urban revitalization. The city said it cost them $6,000 to do the zebra crosswalks and bumpouts on Locke. With curb parking on both sides of MacNab, I think we should get the same treatment at Vine and Cannon intersections. For only $12,000, surely we can do this, and sooner than later. Even the tree planting idea isn't overly expensive. Rip up a square every so often and open it up for new trees like in Westdale. I guarantee you would see even more pedestrian and cycling activity heading north and south on MacNab with these changes along with it being two-way. Key crossings like King/Main & James, King/Main & MacNab, King/Main/York & Bay, King/Main & Hess, King/Main & Dundurn seem like intersections where vehicles and people are thickest, and where zebra/ladder clarity would be valuable. But I'm no expert. The city has collision and mortality stats. It knows its school zones and employment nodes. It knows where speeders and distracted drivers tend to run lights. The rest should follow. I assume you're being sarcastic. If the city knew what to do with its traffic information we wouldn't be crying tears of joy every time the city deigns to paint a white line on the road. It occurs to me that Westdale has a motivated BIA, too. Those can be helpful. MacNab North has potential but it's largely residential, and the city doesn't make a habit of investing in residential neighbourhoods. Westdale BIA's executive apparently has roots on MacNab North, but that might be as good as it gets. I would imagine this portion of MacNab falls under the Downtown BIA umbrella, or perhaps Jamesville? With connection to the Farmers Market, Jackson Square, Copps Coliseum, grocery stores and Asian restaurants on Cannon and a large residential neighbourhood to the north along James Street, I would think this area would be a prime spot for the city to invest in. Perhaps one of those BIA/neighbourhood groups could pick up the cause. I've contacted Councillor Farr at any rate. MacNab falls outside of the Downtown CIPA stimulus zone. The Downtown Hamilton BIA does incorporate some of MacNab South, it contains none of Macnab North, and ends at Wilson. Although there is a James North Merchants and Business Association, there is no no formal BIA on James North. This isn't just a semantic distinction, but a legal one (the BIA is established through a municipal By-law and is governed under the Municipal Act). All of that is doable given community will, and Councillor Farr has probbaly had discussions along these lines with various members of the James North Merchants Association, perhaps even about potential streetscape improvements between York and Cannon. > The perception exists that the City is not giving equitable treatment to more vulnerable neighbourhoods. And MacNab and Vine hardly count as among our most vulnerable or unfriendly streets. The really vulnerable neighbourhoods are in Ward 3. Don't kid yourself. MacNab is a Bay st. detour. There is no active Merchants Association on James St. North. Thankfully. Perhaps we should leave MacNab a 1-way street.... was a glorious ride from Mulberry to the waterfront tonight. Enjoy it while you can! (2)Well, yes, there is - both MacNab and James were each pleasing in their own way. The former leisurely, quiet, leafy and domestic; the latter busy and commercial and interesting and on-toes-keepful.